It sometimes rains! Hmm! Actually, in the UK, it has rained quite a lot of the time in recent years! When this happens, it's always nice to have something photogenic at hand to shoot. 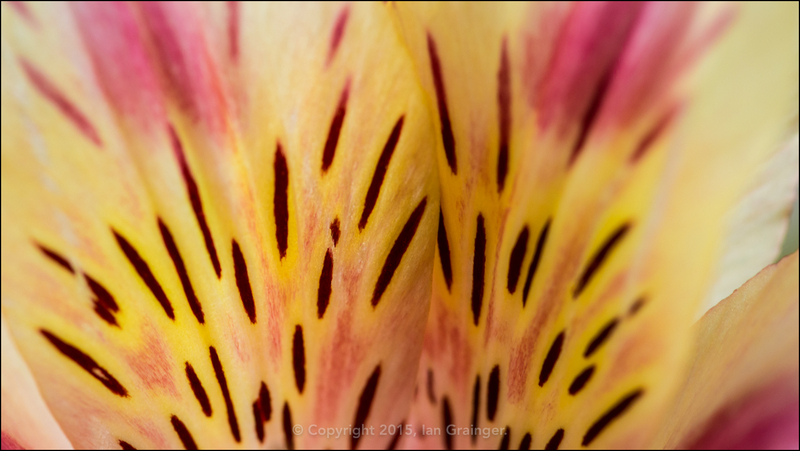 This week, the photogenic was supplied by some Peruvian lily blooms bought to remember what would have been my mum's 79th birthday. Of course, the flowers were pretty enough, but I wanted to shoot them in such a way that focussed only on the shapes, colours and patterns of the petals. I decided to go for a shallow depth of field, and moved in close to pick out a region of the petals that was covered in spots. I don't like using flash when I'm shooting flowers indoors, as it can tend to make the petals look artificial, and usually leads to some unsightly shadows. Neither do I like using a tripod. I find using a tripod a bit too restrictive compositionally. This doesn't mean having to use a high ISO though! Artificial light is no substitute for the sun, and placing the vase of flowers next to a window provided plenty of light to keep the ISO down, and the shutter speed high enough to avoid camera shake - even on a rainy day! I was very pleased with the resulting images, of which this is one, and which is also my Image of the Week!